On the corner of Hillside Drive and 2nd Avenue North in the Ocean Drive section of North Myrtle Beach, South Carolina is Sandwedge. This North Myrtle Beach resort is a couple short blocks to the beachfront while being in a peaceful and serene setting that is fully relaxing. Sandwedge North Myrtle Beach resort is easy to find and centrally located to shopping, dining, live entertainment theatres, water sports, fishing and golf. Make this North Myrtle Beach resort your North Myrtle Beach vacation home and you will not be disappointed. Sandwedge is a mid-size North Myrtle Beach resort that is just a couple blocks from the ocean. 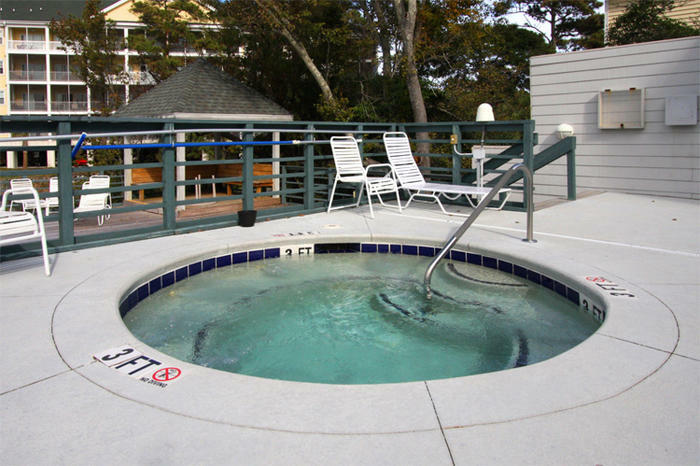 This delightful North Myrtle Beach resort features a sparkling blue swimming pool, hot tub and a tranquil pond. Each of the North Myrtle Beach vacation rentals at Sandwedge has a private balcony with nicely landscaped views. Relax in the gazebo at Sandwedge; it is adjacent to the hot tub and pool deck. Palm trees and lounge chairs make for a wonderful setting for your North Myrtle Beach vacation. Take your pick of the two-bedroom North Myrtle Beach vacation rentals at Sandwedge. All of these North Myrtle Beach condo rentals have two full baths. These condos in North Myrtle Beach, South Carolina can sleep either six or eight people. These non-smoking North Myrtle Beach condominiums are tastefully decorated. The kitchens in these North Myrtle Beach rentals are nicely furnished with full-size appliances that include a dishwasher. All of the small appliances are furnished for you in these kitchens, such as a microwave, coffee pot, toaster and more. The layout of these North Myrtle Beach condo rentals is such that you walk into the great room. The kitchen, dining area and living room are one big open space so your whole family can be part of one conversation. The kitchen overlooks the dining area, sometimes with a breakfast bar. And the dining room is in between the living room and kitchen. The comfortable living room opens to the private balcony where you can relax and enjoy the great outdoors. These North Myrtle Beach condominium rentals are full of amenities. Some of these condos in North Myrtle Beach, South Carolina have high-speed Internet access. Bring your laptop computer and plan your North Myrtle Beach vacation day by looking at the North Myrtle Beach amusements and attractions online. Make reservations for dinner. Pick out your seats at a nearby live entertainment theatre. Choose your tee time at a Myrtle Beach area golf course. Elliott Beach Rentals is not affiliated with onsite management or the HOA of Sandwedge.